How Can I Distinguish Between a Fracture and a Sprain? With a sprained ankle, you will likely be able to walk on the injured foot, although it will feel uncomfortable. Immediately after your injury, it is important to apply ice to the tender area. Take weight off your injured ankle and, if possible, elevate your injured foot. If swelling resolves quickly, you may be able to resolve your injury with the RICE protocol (Rest, Ice, Compression and Elevation), but if your symptoms persist beyond a day or two, you should go see your doctor right away. Self-treating a sprained ankle leaves you at risk for improper healing, a more serious injury, and repeat injuries down the road. The symptoms of a broken ankle are basically exactly the same as that of a sprained ankle: pain, bruising, tenderness and swelling. 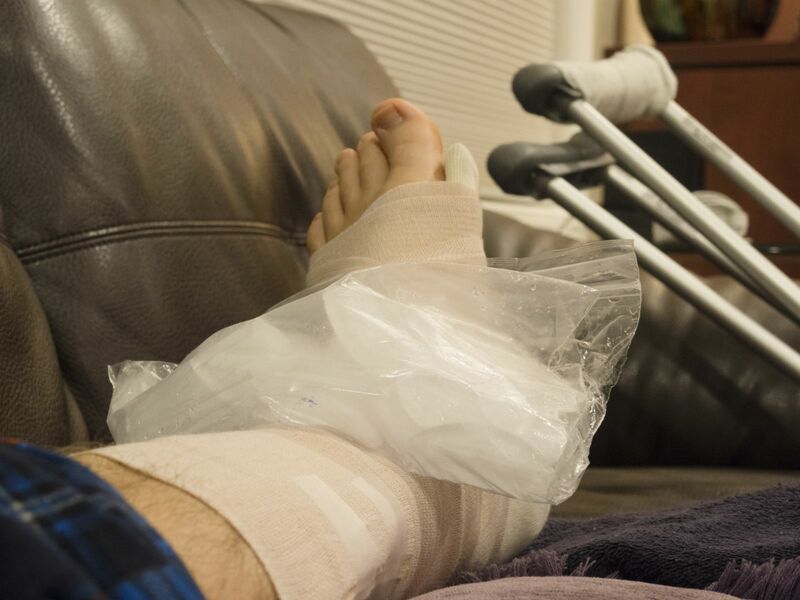 With a broken ankle, you are less likely to be able to bear weight on the injured side, but depending on the severity of the fracture, a limping walk may still be possible. Basically, unless a bone is literally sticking out of your skin (no joke, this can happen), it’s very difficult to know with certainty that you’ve sustained a fracture, and not a sprain. Because of the difficulty in distinguishing between injuries, it’s important to have your podiatrist examine any injury to the toes, feet or ankles. In order to determine whether your injury is a fracture, your doctor will order an X-ray exam. If your X-ray confirms a broken bone, your treatment plan will go beyond RICE. It will include some form of immobilization (probably a cast or brace), and may require surgery. Once your cast comes off, physical therapy or rehab may help you regain strength. It can also make sure you avoid strength discrepancies between legs, or changes in your gait. Your doctor will also help you decide when it’s safe for you to resume your regular activities like unassisted walking, driving and exercise. When dealing with a foot or ankle injury, always remember this: just because you can walk doesn’t mean you aren’t seriously hurt. The only way to avoid making an existing injury worse is to seek immediate medical care and begin the proper course of treatment for your specific injury.